A lot of my customers of the options trading course asked me a question – why I do not provide Nifty option tips? 1. I am an active trader. If I start providing tips my whole psychology will change as my mind will not be free. When my own money is at risk, it is OK to trade freely. I know that even if there is a loss, I will manage it and make money from the next trade. But when I know that a lot of people are following my trading tips blindly, I will either wait for the best time to enter the market which may never come for days and/or try to make money from every trade which is impossible. I will not be able to trade freely. Everyone will suffer. 2. 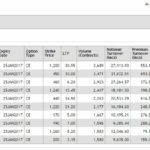 I have started this website to teach traders option trading strategies. Most of my material is free. You can search this website and get a lot of strategies for free. However there are some strategies that almost always work and that is exactly what I teach my customers. 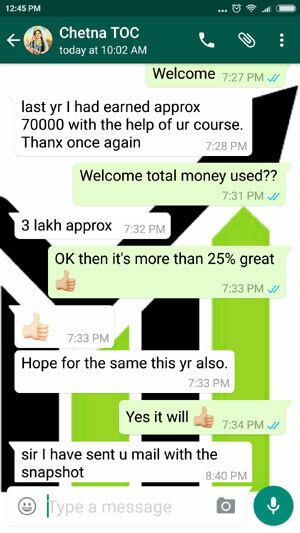 There is lack of education in option trading in India, my objective is to teach people options trading through this website so that they can help themselves rather than depend on someone else for tips. 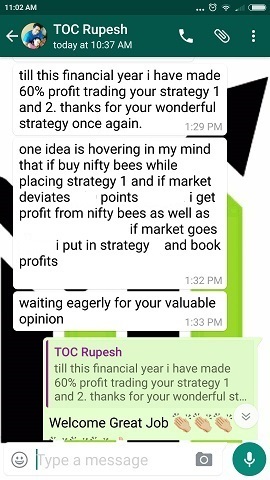 And if you think Nifty option tips providers will make you money, think again. I have also fallen prey to them. Here are some reasons why they won’t make you any money. 1) I have lost lots of money to them – they do not work. Period. You will lose money by paying them AND you will lose money trading their tips. If they were right, why should the option trading tips company give you any hot tips, rather they should invest it themselves and make a lot of money. Hint: Does any of the insider trading guys sell their tips? They trade themselves. Some trading tips providers argue that they give these services to raise capital and make more money. This is not true. They show a return of more than 100-300% per month in their performance sheets. Well, even at 100% per month they can very well start with 1 lakh and make it 409,600,000.00 in 1 year. That is 1 lakh converted to Rs. 40 crores and 96 lakhs in 1 year. Almost all of that is profit. Now tell me why should they give you tips? Do you think this is possible? Even if itâ€™s possible why the hell on Earth will they offer you this great money making tip for a few thousand rupees a month? If they are really that good they should charge 20% or more of the profits, if profits were made. You will not find any options trading tips providing company offering such a service in India. I have not heard even one. All they ask is a fixed sum for the tips they provide BEFORE offering tips for the month. They know very well that a customer will book a big loss within three months and stop paying. If they get one customer, they only keep him/her for 3 months on an average. Some customers stay even less. And then these people hop to another tip provider in the hope of making money not realizing that they are making money for someone else. They make the tips providers rich and themselves poor. These people won’t make you rich. They want your money. Thatâ€™s the reason why they employ marketing people to market their products. If they are really that good, word of mouth marketing should get them customers. They do not need marketing people to get customers. If you want to read a practical experience you can read it here. Do not fall for them. Do not fall for any marketing guy from any Nifty option tips providing company. Educate yourself and learn to trade yourself. Make yourself rich and be proud. 2) Stock markets are more of a strategy and knowledge based industry. People who are looking to make money in the stock market by using someone else’s strategy will not succeed in the long run. Simply because they will never know why the tips providers asked them to buy/sell X or Y stock, and then why asked them to sell/buy at a particular point. If you make money trading their tips one day, the next day you will double your trade only to lose double the amount. Next day if again you win, you will double again the amount. This will happen until one day you will lose so much that you will stop trading their trades. It will also affect your quality of life. If they do not send you tips, you will feel bad. Your job will suffer. You will feel like trading their tips even if for a loss. You will keep checking your mobile for their tips. Trading will become a gamble for you, not a business that you should take seriously. One day suddenly if they stop sending their tips you learned nothing and you will then start looking for another Nifty option tips provider. The poor subscriber starts from scratch. Bottom line – you will never be self dependent. You will never learn how to make money from the stock markets and you will therefore keep losing money. You will keep hopping from one tips provider to another. Until one day you will blow your account and stop trading all together. 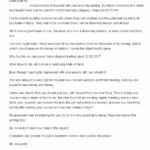 Coming to the point – then why I am offering a course in options trading? I am consulting, not selling anyone any hot tip. You will gain a lot of knowledge, unlike the tips providers where you gain nothing. Once you get option trading education and knowledge of great strategies that work you need not depend on anyone else for the life of your trading. You can generate your own tips and make money trading options. If you won’t educate yourself on options, you will keep losing money. And that is guaranteed. 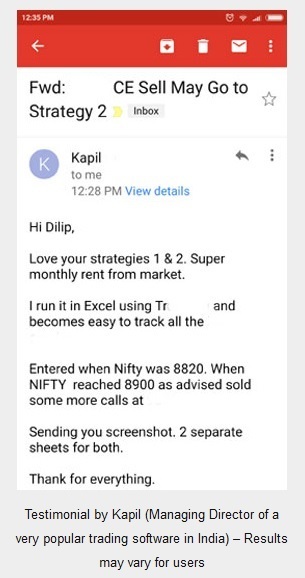 Dear Dilip Shaw, Lost almost everything either by my wrong judgement or wrong planning in cash.Then, I lost rest in Nifty/stock options on paid advisory tips. 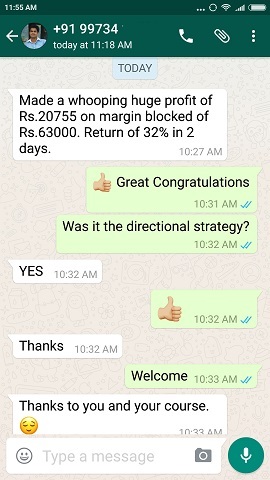 Entry almost 5 points higher the advised price and exit almost 6 to 7 points lesser recommended price because of communication delay or due to their wantenly delayed timings.ending in loss at any and inany cost. Whether there is any scientific strategy which can adopted to earn reasonable profit within small residual money. After losing large chunk of liquid cash and holding, now i have , only 20 to 25 thousand rupees in my pocket. Suggest me Whether it will be wise to continue trading in NIFTY OPTIONs, if so, with what strategy. Your advise respose will be highly appreciated. >>Lost almost everything either by my wrong judgment or wrong planning in cash. You will know why people lose money in stock markets. I assume its not just you and me, its almost every retail investor who does the same mistakes again and again. >>Then, I lost rest in Nifty/stock options on paid advisory tips. That is the reason why I do not even visit their websites. Tips providers are SCAM. Its better to do your own research and invest in small amounts. You cannot get rich by their tips. Neither can you get rich instantly. Its a process that takes time. 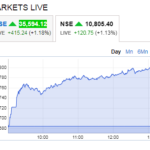 >>Entry almost 5 points higher the advised price and exit almost 6 to 7 points lesser recommended price because of communication delay or due to their wantenly delayed timings. Ending in loss at any and in any cost. Why did you trade when you did not get their calls in time? And why did you exit before? This is another problem. The SMS takes time to reach and people just trade whatever they can. Stock market trading is a point business, one point loss is not a point loss but money loss. You should have known that. >>Whether there is any scientific strategy which can adopted to earn reasonable profit within small residual money. KRISHNALAL I personally do not believe in Technical. How can Stock Markets be science? How can prediction be science? If it was it should be taught in colleges. I am sure stock markets technical course is easier and cheaper than an Engineering course. So why not young people invest in a technical course and make money in the stock markets from there home? Why study so hard for years to get a job of Rs. 25,000 only. They can do a technical course and borrow some money from parents and start trading and make money from home which is much better than a job. Life is not that simple. >> After losing large chunk of liquid cash and holding, now I have , only 20 to 25 thousand rupees in my pocket. Suggest me Whether it will be wise to continue trading in NIFTY OPTIONs, if so, with what strategy. Your advise response will be highly appreciated. Frankly with 25,000 rupees you cannot make it big. Can you start a business with 25k in India? Stock markets is also a business. You have to have money to make money. However in my course the strategies are such that you need only Rs. 50,000 to start with. If you can invest 25k more you can take the course and start trading. Remember that they are all very conservative strategies, so the chances of a big loss is ZERO. At 1% loss and 3-4% of profits it is obvious that you should start making some money. You may need to compound it (not withdrawing cash from your trading account) to make sure your trading account grows with time. Now you do the math to know how much money you want to make from the stock markets and how much time will it take at a conservative estimate of 3% per month (with practice it should be more). But you have to take this very seriously. I hope I have cleared your doubts. It was sad to read what you had written. But frankly Sir why do you think in any Job or business there is a retirement age? That is because human body cannot cope with the pressures of earning money. God gives us 30-35 earning years to make, use and accumulate wealth. It looks like you may have had responsibilities that needed more than you earned. A simple way to a rich life (money wise) is to live below your means. Most people save enough money by the time they retire. Frankly speaking money accumulated for retirement life should not be used for options trading. This is the money you need right now and cannot take risk with. Donâ€™t get me wrong Sir, the strategies I teach do work, but I am not comfortable if someone brings his retirement money to trade. They are for younger people who still have at least 10 years or more to retire. These strategies will help you to accumulate wealth for your retirement. Yes the strategies I teach have a limited risk – but there is risk. And this is a business – just like any other business. Young people can and should take a little bit risk in the stock markets but they should book their profits before 60 and live a peaceful life. Right now the only advice I have for you is to go to a bank and Fix Deposit (FD) whatever money you do not need for the near term. The rest can be used for daily needs. And sorry to say Sir, but please take a job preferably in the area of your expertise if you donâ€™t have enough cash for daily needs. As usual the post is excellent. More than the post I liked Ur answer to the comments of KN ji. Hat’s off to Ur sincere advice. Amazing clarity in Ur writings. Love to read more and more of your posts. Thank you Sir. Please keep reading and point out the mistakes if any. Suggestions are also welcome.